40 x 40 x 50 cm. 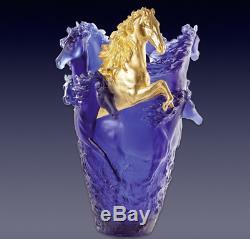 The Maison Daum presents the blue magnum horse vase with one gilded gold leaf head. The mesmerizing intensity of the colour and the refined details of the vases, narrate the scene of thoroughbred horses galloping freely in the fields; their manes blowing in the wind; their muscular legs and hoofs frenetically beating the dust. Daums exceptional pâte de cristal immortalizes and captures the motion to create these remarkable vases. All our items come Brand New in their original box never taken out of the box, never displayed and in PERFECT CONDITION. (We guarantee no chips, cracks or defects). Ships your package according to Incoterm Delivered Duty Unpaid (DDU). Each marvelous piece is packed with extra care and double boxed. Our mission is simple, to provide the very best. If you dont find an item that you are looking for please ask us and we will do our very best to get it for you. Thank you for your interest. 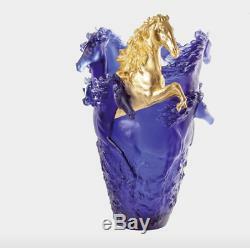 The item "Daum Horse Vase Limited Edition Blue Gold 05381-11" is in sale since Saturday, January 27, 2018. This item is in the category "Pottery & Glass\Glass\Art Glass\French\Daum". The seller is "vipshoppro" and is located in GI. This item can be shipped worldwide.